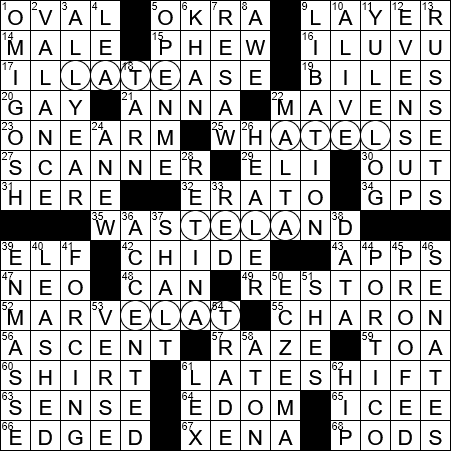 Apologies for the tardy post on the NYTCrossword.com blog. I had it written, but failed to schedule it correctly. Let’s blame jet lag. But, thanks for pointing it out, Dave. That helped me a lot, because I had no idea it hadn’t appeared on schedule. I don’t say anything like that because I know I have no reason to, especially as days like today remind me. Besides, if I did consistently beat Bill, I wouldn’t say anything anyway. 14:10, virtually identical to my NYT time of 14:14. Btw – that blog is now posted for today. Didn’t know VALANCE nor TARN. I also didn’t know a LIBATION is a drink dedicated to a God. I never realized how religious I am. I’ve probably had enough tequila to qualify as a saint, I’d say…. You’re getting into languages I’ve never heard of although I did recognize “Irish” in that one as well. I think it’s usually called Gaelic, but I’ll let it slide this time and give you credit for a two for one there. I had a good time with this puzzle – a little challenging, but doable. I got the theme after the last answer. Very cute. I thought Libation was from Liberation. I know it is used as a fancy word for a drink, nowadays. I’ve heard of Tarn before, probably some novels about Switzerland etc. My wife made some valances for the windows in our bedroom, but they were taken off after some years, to be dry cleaned, and were temporarily stored under our bed …. where they still reside to this very day …… ( we don’t have visitors in our bedroom, except for the ladybugs and wasps that creep up the air registers … ). Carrie, nice attempt at incorporating other languages …. I did not relize that the excersize could be so difficult. Hindi is a dimunitive for hindustani – when hindustan was the general area of India —- centuries before, and not as the land of the hindus. I did not know, that hindi can be written in several scripts – not only devanagiri ( ‘God’s town’ ) …. but also in scripts , one of which was where the entire paragraph or sentence was written out as one word…. ( to save space). Also there is a script, which was a secret code, known only among businessmen, when letters were rarely sealed, and open to inspection, and mailed in uniface. You had to be literally born in a mercantile family, to have known of this script, as it was not taught in schools. Truly coded words and languages have been invented since time immemorial. Since I generally dont watch sports or the Olympics – I am shocked to learn of gymnasts and swimmers who have individually won four, five golds, …. and even more multiple gold and other medals in one Olympics !! Simone Biles, being todays learning moment. It seems so unfair …. that there are dozens of countries who have never won a medal in multiple Olympics ….. Pretty easy Wednesday; took about 20 minutes with no errors. Spent a couple of minutes on “Trip up” and “Compelling” for some reason. @Carrie – Oh well, que sera sera. Mexico had a perfect plan and executed it to perfection, so I wish them well. The only good thing is that most of the favorites are also doing just so so, so far. @Bill – Oh, on yesterday or Monday, the guy from “Route 66” and “Dragnet” passed away in 2015. Martin Milner, great actor! Off to bed early, for one of the Summer markets. Hey Jeff! I guess I know of some obscure languages because I’ve taught ESL for many years and have run into them. Glad to speak Spanish, as that is the most common — tho I have had many students from Guatemala, which has 22 indigenous languages. Those would, for the most part, be quite hard to hide in a phrase….but i may try. Dirk!! I’m sorry your team lost that game, but it was awesome for us Mexico fans!! And how about that Icelandic side? ?